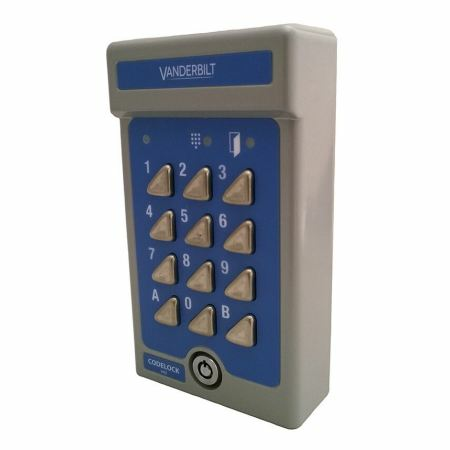 Please note the Siemans Bewator keypad is now manufactured by Vanderbilt and is called a V42! The Bewator Siemens K42 Electronic Keypad 12/24V AC/DC has a codelock with two code combinations and is for internal or external use. It has stainless steel vandal resistant keys. Surface mount, backlit keypad. The Bewator K42 is a versatile access control push button keypad. With the ability for two separate user codes and time sensitive activation you will be able to have a separate code for day staff and the cleaners. This means that only the right personnel are able to access your building as and when necessary, improving your security. With the Siemens codelock K42 you can adjust the activating time, making it longer or shorter, to ensure that there is enough time for a user to open the door, but not so that security is compromised once they have passed through. With the added bonus of switching on the backlight so that the K42 keypad is visible even in the dark this access control keypad is an obvious choice. Once you have added the K42 to your basket, why not check out our K42 accessories such as replacement keys and spy shields. Electronic keypads are designed to offer a high level of access control for limiting access to certain areas of the building, ideal for business and hospital properties. But with the Bewator Siemens K42 Electronic Keypad 12/24V AC/DC offers more than just security, it has a unique finish with triangular buttons; you don't get to see this kind of style very often! We have used this system before, it is a great little door controller easy to install and setup. Could be better protected against moisture, this is the third one I have replaced in ten years. Chuffed! Perfect for what I need, thanks! Bought several of these before, first time I've purchased from mechlite but it's the same great product and delivered next day. Will probably buy more in the future.